We separate our camps into 4 seasons: Winter, Spring, Summer & Fall. Camps are then sorted by age group and labelled according to the type of camp. See below for a listing. All our camps are technically VISION Camps. All instructors are Manitoba-certified members of VISION ELITE Volleyball Club. Come learn why our athletes are among the most technically sound athletes in the province. For more camp information, join our monthly newsletter! Free Camps are held throughout the year at different times, dates and locations in Winnipeg. These are generally held at the start of a season as a free introduction for athletes who may not be familiar with the quality of our camps. These camps are a great introduction to the training techniques used by VISION ELITE coaches and include a review of the fundamentals the game, skill progressions, and positional-specific considerations. See if we are running a free camp this season! Simply put, VISION Elite allows for drop-in camps where athletes can drop-in and receive some personal coaching on an ad-hoc basis. These camps are available on a drop-in basis and are available year round. The cost for these drop-in camps is $20. When attending our Personal Coaching sessions feel free to attend with a clear understanding on what aspects of the game you are struggling with. Regardless of whether you have questions about how to improve basic skills, correct bad habits, or better understand aspects of positional play, your VISION Elite personal coach can walk you through all aspects of the game. VISION Elite Player Development Camps are All-Skill Camps. With VISION coaches being amongst the most technical coaches in Manitoba these are very popular camps. We review each skill and break them down so every athlete can understand. Questions are encouraged and VISION coaches pride themselves in producing students of the game who understand the fundamentals of the game. Common bad habits are also reviewed and addressed. Muscle memory is key, so these camps are high-repetition sessions with little standing around. These camps are generally for athletes in grades 9+ and are focused on Setters, Middles or Outside Hitters. Liberos would join outside hitters and identify themselves as such at the start of the first session. Each position in volleyball is unique with a focus on specific positional technical requirements and tactical understanding. Any athlete aspiring to play competitive volleyball should include a positional camp among their training regimen. Elite Camps are held throughout the year at different times, dates and locations around Winnipeg. VISION Elite Camps are designed for those athletes who are technically proficient in the skills of the game and are looking for the mastery of advanced progressions of the skills of the game. These are not game-like sessions with team play, but rather an introduction to advanced skills and exercises on how to master these skills. Participating athletes should possess two years of club volleyball experience. Prep Camps are held in the Fall to prepare athletes for December tryouts for VISION Elite Volleyball. These are skills camps for athletes in grades 6-8 and may include some positional training for athletes in grades 9+. All sessions will begin by introducing athletes to the training techniques utilized at VISION Elite and each begins offering team play after the first four initial weeks of training. As the camps come to a close a review of what to expect at selection camps is undertaken to ensure athletes are prepared for club tryouts. ID Camps are offered to all athletes who aspire to play for VISION ELITE. These "tryouts" are for our club teams and are held in early December. ID Camps are pretty straight forward and include a parents' information meeting with hand outs on detailed information of the program available. Athletes will generally attend tryouts until selected or the teams are filled. VISION offers two summer camps for boys and girls in grades 6-8 and 9-10. These are unique as athletes are placed on teams with an assigned coach and train as a team for the week to compete in a camp tournament at the end of the week on Friday afternoons. One camp is held during the second week of July while the second day camp is held during the second week of August. The Christmas Jamboree Camp is an annual two-day camp between Christmas Day and New Year's Eve. The camp is a review of the fundamentals of the game as athletes prepare for their upcoming club volleyball season. Coaches will also review bad habits and techniques on how to correct these. Spring Break Tune-up Camp is an annual camp offered after almost three months with a club coach and/or indoor league coach with a fresh perspective from a camp instructor is a great opportunity to review one's understanding of the fundamentals of the sport. WHAT YOU WILL LEARN AT EVERY CAMP! Individual digging and pursuit drills, every area will be examined thoroughly with progressions and drills to accompany each component of team defense. Find out how hitters and setters can always stay on the same page with what they are doing and why they are doing it. Wash and rally team drills with alternative scoring systems. Specific team drills with a single focus. Offense, Defense & Side-out. 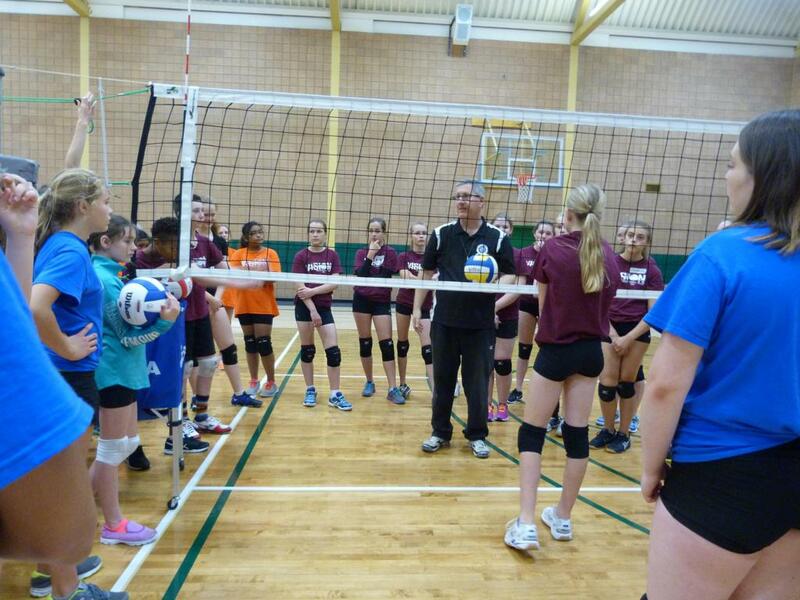 These camps are conducted by experienced VISION Elite Volleyball Club coaches designed to challenge participants. The objective of the camp is to produce fast-paced sessions in which everyone is engaged in the drills. This is an excellent opportunity for athletes considering club volleyball to come out and meet our coaching staff and other athletes also interested in pursuing club volleyball. Come out and see for yourself why VISION Elite is the very best place in Winnipeg for technical training. VISION Elite Volleyball Club is the Volleyball Winnipeg High Performance Program. VISION teams represent our club at Provincial and National Championships. Try outs are held in December and the Club Volleyball season runs from December until May. 5: Incorporate a progression of skill development. For more than 15 years, VISION Fall Prep camps have developed a track record of producing athletes who are successful in making a club team in the competitive December try out process. We are especially proud of the dedicated coaches who have participated in the VISION Prep program over the years. Their hard-work and enthusiasm for participating athletes is contagious and motivates athletes to work hard to improve and get their game to the next level. Athletes in the U15-16 age class can expect to be introduced to advanced progressions of each skill while U13-14 athletes will focus on the fundamentals of the game.